Grocery shopping on a budget? 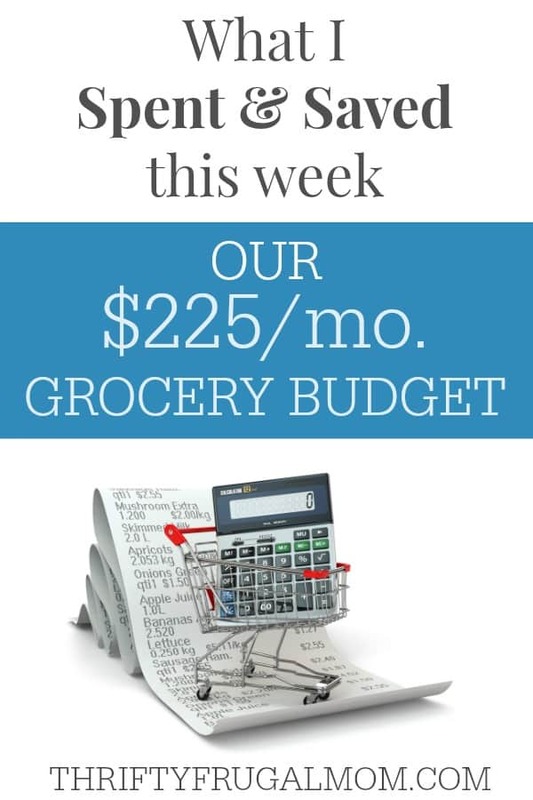 Let me show you the details of my $225 a month grocery shopping trips and teach what I do to save money and live well on a low grocery budget with my family of six! Some of you have wondered where I get my printable coupons. Here are the main coupon sites that I use: Coupons.com, Smart Source, Red Plum, Ibotta, Fetch Rewards (use code GEOEG at sign-up for $2.00 in points! ), Checkout 51 and Saving Star. Manufacturer websites and Facebook pages are another great source. All of you long time readers know that up until about a year ago, I posted What I Spent & Saved posts like this weekly. And while I don’t plan on having them become a regular feature again, I had such a good week grocery shopping with coupons that I just couldn’t help but share it with you! I realize though that only a very small percent of you all actually shop at the same two grocery store that I do (Giant, which also goes by Martins or Stop and Shop, and ShopRite), however, I still think you can benefit from some of the tips and things that I share and hopefully can get some ideas and inspiration for saving more on your own grocery bill. * I live in an area where most grocery stores fully double all coupons up to $1.00. So anything $.99 or above will double, which is why the $0.75 coupons you see below note that they doubled to $1.50. This definitely helps me get better deals, although I have to say that even before we moved here to Philadelphia and I shopped at stores that didn’t fully double, I still often got very similar deals. So getting great deals still is possible even without fully doubled coupons! * The Load to Card coupons that you see mentioned below can be found on the grocery store’s website when you create an account with your store card. I think most major grocery stores have this option any more and it’s a great way to save a little extra. I typically just go into my account and clip all the coupons, that way if I happen to buy something that I hadn’t planned on buying and it had a Load to Card coupon available, I’ll get the savings. And that has happened quite a few times! To get the most savings, you can combine a manufacturer coupon with a store coupon and/or coupon app offers from places like Ibotta and Checkout 51 when available. * Under no circumstances is it legal to photocopy a coupon. For printable coupons, most manufacturer’s let you print two coupons per computer and then your limit will be capped. * Coupon availability changes all the time, so the links that I share below will soon be out of date and not take you to the exact coupon that I linked too. I’m sorry about that, but it’s just how coupons work! * The two websites that I use to save me lots of time and get my deals from are For the Mommas and Living Rich with Coupons. Okay, so now that we got those details covered, let’s get down to the specifics of this week’s shopping! I realize that all the numbers below can get kind of confusing. I try to break it down in a way that is easy to understand, but I know that it’s still kind of hard to follow sometimes. So if you have questions, please feel free to ask in the comments! Basically though, I got ALL the groceries that you see below for just $14.67 total, after all coupons and savings! Less than $15, you all! This is why I feel like it’s worth using coupons. No, not all weeks are this amazing, but many are. And there is no other way that we’d be able to eat as well as what we do and keep our grocery budget this low. Updated 8/24- actually I only spent $10.67 because today I got notifications from Saving Star that I received $4 for buying the Butterball turkey. I had totally forgotten about that offer when I bought these, but it sure made the deal even sweeter! These Giant deals will be good through 8/24/17, so if you shop before that, you should be able to these same deals yourself. Giant has a gas rewards program that is really awesome. 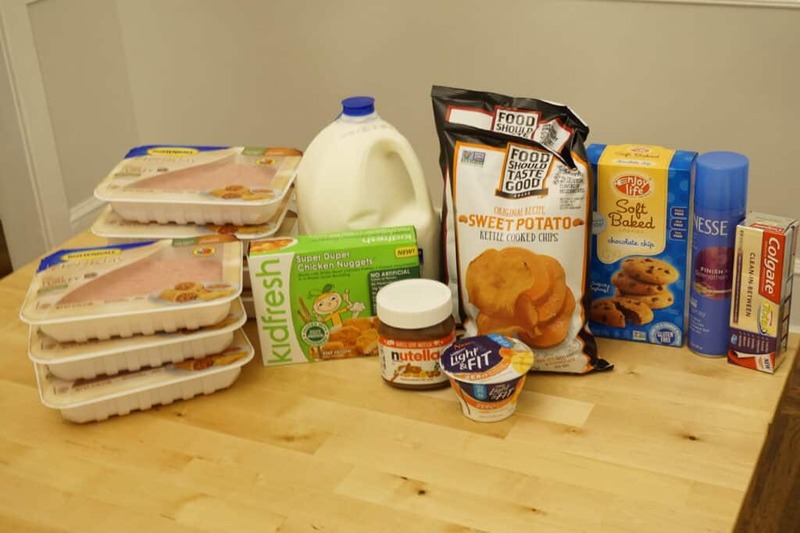 Basically, each week they have roughly 12 to 24 items that are part of the gas deals and when you purchase a certain amount of these items (you can mix and match them), you can earn savings on gas purchased at Giant gas stations. This week, those gas reward helped save me a lot of money and get some amazing deals! My favorite deal at Giant this week was by far the string cheese. 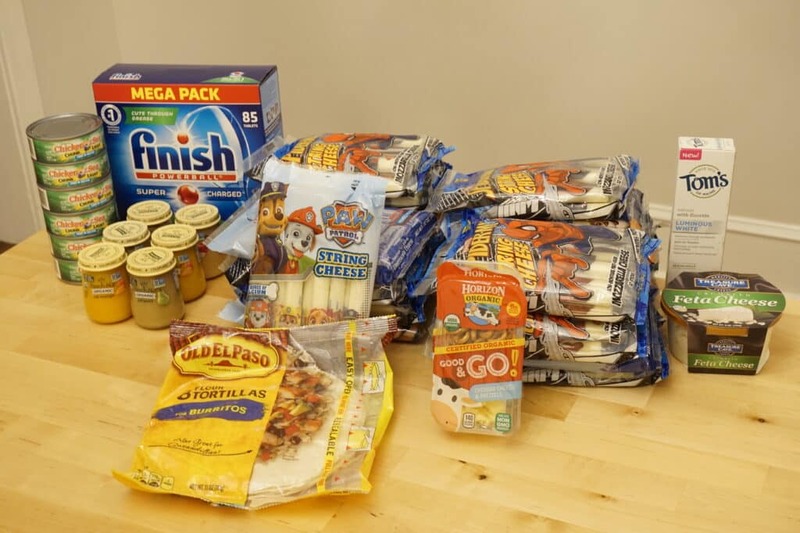 The Marvel and Paw Patrol string cheese and Tom’s of Maine were part of the gas rewards deals and when you bought 4 of any of these, you saved $10.00 in gas. So after all coupons and gas savings, I paid just $0.12/pack for the string cheese and $1.00 for the Tom’s of Maine toothpaste. That’s some crazy cheap cheese! I had to laugh when the cashier was ringing me up and asked in a very serious voice, “So, you all like string cheese, I guess?” I told her that we sure do, but then explained the great deal and she was rather amazed and totally understood why I bought so much! We’ll probably eat most of it like it is, but I may end up shredding some of it too when I make homemade pizza and that sort of thing. Thankfully, string cheese doesn’t go bad very quickly! The Beechnut organic baby food was also a gas rewards deal where you got $7.50 in gas savings when you bought six. I had a $1 off 5 coupon that I used, which turned these into a $0.16 money maker- the only reason I actually bought them! The Horizon Organic Snack Trays were a $2 money maker after all coupons. The Chicken of the Sea tuna was just $0.29 each after the Checkout 51 savings. I paid $1.50 for the Treasure Cave feta cheese after all coupons, the Old El Paso burrito shells were free and the Finish dishwasher tablets were $9.99- not the best price ever but we were almost totally out and this price still beat anything I could find on Amazon! These ShopRite deals will be good through 8/26/17, so if you shop before that, you should be able to these same deals yourself. ShopRite was a new store for me when we moved to Philly, and while it’s taken me a bit to get used to shopping there, I’m learning to really like their store! While we aren’t big fans of plain ground turkey, I’ve found that if I mix it half and half with ground beef, we don’t mind the taste at all. And actually, I thought this Butterball ground turkey tasted better than most other brands that we’ve tried, so I actually may end up using it as a substitute for ground beef in some of our favorite dishes like this Crockpot Tamale Pie. The Kidfresh Chicken Nuggets cost me $0.55 after coupons. While these are geared for kids, you might remember that our whole family actually loves them and when I can find them cheap like this, I love to use them for a quick dinner on busy evenings! I love Food Should Taste Good chips and loved that I could get 2 bags totally free this week after coupons and sales. The Enjoy Life cookies and Dannon Greek Yogurt were free as well, and while they are something that I wouldn’t typically buy, for free I’m more than happy to take them home! The Nutella was another freebie that my husband was excited about. I’m not a fan of it, but he loves it! The Colgate toothpaste was another free item and the Finesse hair spray was $0.25 after coupon savings. And the milk, well, it was no great price- we simply need it! And those of you that have cheap milk prices can look at what I paid and feel grateful for your savings. 🙂 I always kind of inwardly gasp when I hear about people paying $2 a gallon for milk. I can’t imagine those prices! So there you have it- a little peak into my weekly deal shopping trip! What was your favorite deal? I caught milk last week for $1,09 a gallon and eggs were $.29 a dozen! Best deal I have seen in a while on these two items. My husband and mom laugh when I come home from the store with tons of items that we don't normally use (deodorant, toothpaste and such) because they know I either paid pennies for that item or got them free and made some money off of it. My husband tells people he has enough bath soap and deodorant to last years and it was all free (and I made money off of it)! Wish our stores would double coupons but alas they stopped a few years ago. Sometimes it makes it harder to get a good deal on some things but other times between the store sales, ibotta, C51, Saving Star and Mobi I still do good and get a lot of free items. Those milk and egg prices- wow!! We have some family that lives in Virginia and their prices are pretty much the same as yours. I try to comfort in the fact that that at least I'm helping the farmer's out. :) I have no idea how they can make it on low milk and egg prices like that. And yes, I have a huge stash of things that I wouldn't normally buy too. But it sure comes in handy, doesn't it? I've had fun sharing with family and friends when I get way more than we'll use in any reasonable amount of time. And it sounds like you've figured out how to still do pretty well even without double coupons....I know it would make it much harder though! Milk is 84 cents a gallon & eggs are 39 cents here and those are regular prices. Milk was down to 69 cents a few weeks ago on sale. It really has been such a huge blessing to be able to get deals like this and it's one of the things that has helped us survive financially during some lean times. I know many places have stopped doubling coupons and I keep waiting for it to happen here, but until then, I'm going to enjoy it. :) Isn't it so fun to get paid to shop for groceries! My husband likes to tease me that "I rob the store" when I come home with free or moneymaking stuff. And I agree about the snack packs. I actually got terribly hungry when I was doing my shopping trips so I ended up eating one in between stores and rather enjoyed it! We eat them occasionally for snacks, but we actually don't snack much. So typically when I get them like this, I use them a lot as cheese to go along with soup or other things at lunch and dinner. I actually shredded 2 yesterday for a Mexican type dish that called for shredded cheese on top, and will likely do that some more too! Sure beats spending $2.50 or more a lb. for cheese! I think this is super great and all... but what's for supper? or breakfast? How do you feed your family of 6 on that for a week? Life has been difficult for a while. I am grateful each and every day that I know how to shop like this. I just spent 250.00 at various stores. Buying loss leaders ,using coupons and other savings, I easily have 600.00 worth of actual food. No junk. That includes 125 lbs of meat. My stockpile is good for at least 18 months of meals . Issues will be resolved next year. Meanwhile life is good. We have what we need. Wow, Brook, I'm so sorry life has been difficult...that's obviously never fun or easy. But your comment inspires me! That is incredible and such a blessing! And I think what I love the most is your attitude of trying to make things work and also being grateful for the good that you do have. Thanks so much for sharing! It makes for entertaining reading for sure. I spend about $250/month for all groceries including papergoods, personal hygiene and pet care (that invludes a 100lb Anatolian). I go to one store, don't use coupons and never purchase anything we aren't planning on using. I only shop twice a month, have a daily menu, cook heart healthy (hubby had heart surgery). We only use cash (even for buying cars) and pay cash for cruises 3 to 4 times a year. You are making a good start! Limit gimmicks and you might be surprised at how far ahead you will be! Live like no one else so you can live like no one else! (And trash the coupons unless they are a store brand already on your menu!). Well, I'm glad that you could be entertained! ;) I love that you enjoy living frugally too. I have to disagree with your suggestion to trash coupons though. I don't think I'll ever stop couponing. It has saved us thousands of dollars and we enjoy eating much better quality meals than we would otherwise be able to afford. And for our growing family of 6, it's been a huge blessing! I realize that not everyone will find that couponing works for them...but I'm a big fan and recommend it to anyone that wants to give it a try. Our milk in East Cincinnati metro area is 98 cents a gallon! Been that price since we moved here 2 years ago. Eggs are 48 cents a dozen. However, we now buy organic and it's $6 a gallon. Whoa! That's crazy, Bev! I can;t imagine those prices. My parents live in Maryland and eggs and milk are considerably cheaper there, so I always try to stock up when we visit!